In the last month or so I’ve been having a clearout too. Alan Bennett’s papers may have been deposited at the Bodleian, where they belong, but mine have also found their place, at the local tip. In all about eight feet of shelf-space, dating back to the mid-1980s: all my undergraduate essays, PhD notes and research, early articles, research and manuscripts for books, and writing of all kinds. I discovered that once upon a time I wrote quite a lot of poetry of extremely poor quality. I hadn’t looked at any of it it for years–perhaps two decades–and I’m never going to again. Besides the papers, the volume of junk was extraordinary. Who wants a broken radio, covered in emulsion paint, that was cheap and nasty when it was new, in 1983? There was a lot of junk, but in amongst it there was some lovely stuff, such as the typewriter in the picture. 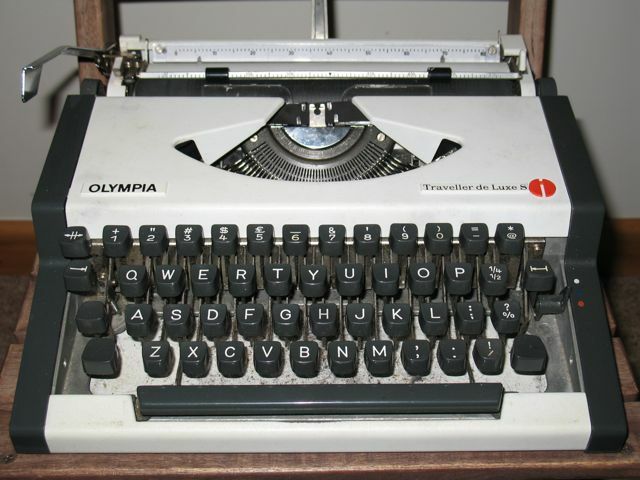 It’s an Olympia Traveller Deluxe S. Look at the styling: the squared-off modern lines, the contrasting colours. It tries its best to be an up-to-the-minute piece of technology. It’s essentially a 1960s design but it’s trying to fit in with the gently humming IBM clones and Macintoshes of the 1980s. These were the dying days of typewriters and this is one of the last. I think it’s beautiful. I bought the typewriter as an undergraduate in 1986, by which time its days were already numbered. I’ve always had terrible handwriting and I thought that my grades would improve if I started typing out my essays. I was right. It cost me £35 and although it is heavy its great advantage over any of the computers available at the time was that it was genuinely portable. I used it all the way though my undergraduate years and kept using it as a cash-strapped post-graduate until around 1992. By then I was already using computers some of the time, but I typed three drafts of my MA dissertation on Joseph Heller–a total of 60,000 words–on that machine. The arrival of large numbers of public access PCs in university libraries put a stop to it, but it is worth noting that although I was able to read the drafts typed on my old Olympia before I threw them away, the floppy disks I used in the early 1990s, which hold my writing from that period, have long since stopped working. So a week or so ago I brought the old typewriter down from the loft and put it on the table in the sitting room. I took off the protective cover and slipped a piece of A4 into the carriage. It was surprising how familiar and normal it felt. I wound the paper into position and hit a key. It hurt my finger and I didn’t hit it hard enough, but after nearly 18 years of neglect the ribbon still had enough ink in it to leave a mark. My four year-old daughter couldn’t believe her eyes. She’s had her own user account on our home PC since she was old enough to sit up and bash the keyboard with her fists and is happy now to login with her name and password. She thinks that when you click the ‘Print’ icon a printer in another room comes to life and out come words and pictures for her to colour in. On this thing she’s hardly strong enough to leave the shadow of a letter on the paper. She’s fascinated. There is more junk to go, but the typewriter is going to stay. I don’t know if I will use it. There seem to be ribbons available still–yes, I already looked–and with some oil and a good clean this machine will be in perfect condition. It seems mechanically sound despite being filthy, but you can see how much I used it from the way the paint has worn away next to the space bar. The sensation of pressing the keys and seeing things move is quite magical, but it is also a reminder of how much slower life must have been back then. The mechanical effort involved, the drafting and redrafting, must have taken a very long time. Your essay is compelling. Words on paper are under-rated. I use a typewriter to write broadcast scripts in the field where printers and cables would be a nuisance. I shall be taking my Olympia Traveller Deluxe to Afghanistan next week. (I do not like its plastic case and appearance, but it is the same typewriter inside as several other Olympia models; they are all extremely reliable, and this one is the easiest to carry.) Yours was probably made in Sarajevo in the 1980s. As you will know, there is no second-hand value to a common typewriter but even if you cannot use it your children and grandchildren may enjoy it as a novelty. Thanks for the comment(s) and the very best of luck in Afghanistan. It would be fascinating to hear how the typewriter fares in that environment. I’m not keen on the plastic case either, but it does seem to be quite tough. The failure of floppy disks I mentioned in the essay has encouraged me to take a lot of care these days not only with storage but also with file formats–I don’t intend to lose work again. I hope your assignment goes well. Wow, that’s a serious typewriter fixation. I hope you enjoy the Traveller. I bought the self-same typewriter in 1990, but I actually already had an Amstrad PCW word-processor at that time, but I wanted the typewriter to be portable! I just looked it out tonight, and it still seems to be going strong. I’ve decided to send for some new ribbons, and get it going again. I learned to type on an electronic typewriter, but I still like the old manuals. One of the things that attracted me to the Olympia was portability. I have no idea how heavy it is, but it is heavy by most standards. Even so, I used to carry it around in a rucksack, use it on trains and so on. The clatter must have driven other passengers mad. I don’t know much about fixing them. Could it be technique though? Very few people are using manual typewriters these days. I’m not quite sure what you mean by ‘types in double’. Do you mean the letters repeat? Or could it be typing on more than one piece of paper?